The weather is gorgeous! Fingers crossed that the last freeze has come and gone. I’m itching to fire up the grill and enjoy some alfresco dining. There’s nothing like sitting on the back porch after dinner outside in the cool evenings watching the grandchildren hula hooping, hopscotching, or jump roping. The enticing aroma of grilled meats still lingers in the air and mixes with the intoxicating smells of spring flowers blooming. They always seem to send out a stronger scent as the sun goes down. In this haven, I can honestly say that all is well with my world. 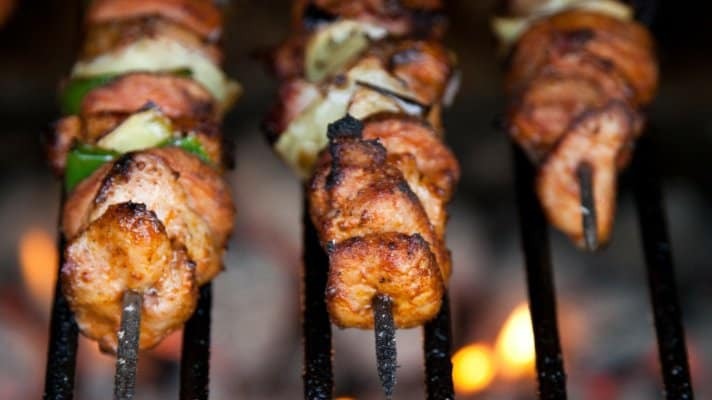 My favorite meats to grill are chicken and beef kabobs. For chicken, I use a lemon base, and for red meats, I use a red wine vinegar base. Otherwise, the recipes are identical. I find it easier to cube my meat while still slightly frozen. That way, it’s easier to cut off the fat and cartilage, and the butcher knife slices through the meats cleanly. Place the cubed meats in zip lock bags with the red sliding tabs on top for security, smother the meat with the marinade, slide the tabs closed, and gently massage, ensuring that the meat is thoroughly covered. To flavor the marinade, I pick whatever fresh herbs are flourishing in the garden, rinse, and finely chop. I like to pair rosemary with red meat and oregano or thyme with chicken. I also add to the marinade pounded garlic and salt using my mortar and pestle. Store the filled bags flat in the refrigerator for at least four hours. Skewer with or without grilling vegetables like peppers and onions. Serve with pita bread pockets. What inspires you to turn the grill on?